Days ago, thanks to wonderful people who post movies on the Internet (thank you so much! ), I could finally watch Behind the Candelabra and what an excellent movie it is: I expected something good because, well, it is a movie directed by Steven Soderbergh, but it turned out to be so much more than what I’d expected because of Michael Douglas and Matt Damon. I could never have thought Douglas could deliver such an amazing performance – I guess that depending on how old we are we tend to associate him with the action hero type or the sexual roles he played in the past (I liked him a lot in Traffic, too, and it’s not his fault Oliver Stone ruined Wall Street: Money Never Sleeps). For a couple of hours Douglas was Liberace, going the extra mile and doing so much more than just wearing extravagant clothes – the voice, the hair, the manners, it was all there, all perfectly executed. I love versatile actors and that is why Matt Damon is one of my favorites: with his pretty face he could have easily settled as a heartthrob and taken the romantic-comedy route, but he chose diversity instead and has showed us what a great actor he is. He’s brilliant as Scott Thorson and it’s a shame him and Douglas are going head to head in the awards season, because both deserve to be showered with awards. Very lightly butter a 20x30cm (8x12in) baking pan and line it with foil (the butter will keep the foil from sliding around in the pan). Place the chocolate and oil in a heatproof bowl over a saucepan of barely simmering water – do not let the bottom of the bowl touch the water – and stir occasionally until melted. In a large bowl, combine the cranberries, marshmallows, Turkish delight and pistachios. Set aside about 1 cup of the chocolate mixture and pour the remaining over the ingredients. Stir until well coated. Pour mixture into prepared pan and press it down. Drizzle with the reserved chocolate and smooth the top with a spatula. Refrigerate for 1 hour or until firm. Cut into pieces, remove the foil and serve. 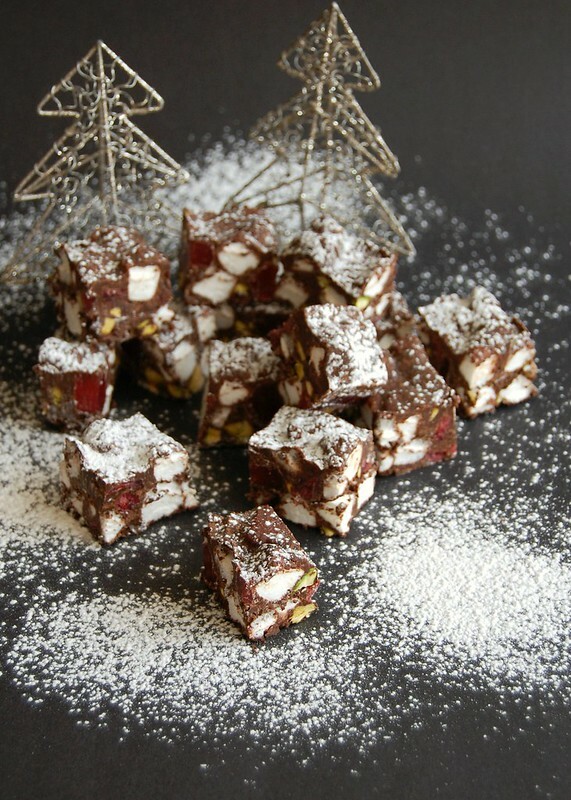 Your rocky road is so pretty and festive! I liked the movie too! And I love your Rocky Road, looks delicious! I wish I had a piece or all 74 of them!